Where Does Papaya Come From? Is Papaya a Fruit or a Vegetable? Important benefits of the tropical papaya fruit include its rich stores of essential vitamins and supporting phytonutrients, such as the enzyme papain, which is thought to be papaya's main source of healing actions. Rooted in traditional and modern folk medicine, some papaya-based herbal treatments are now backed by scientific research. Alleviating gastrointestinal issues. The antioxidant enzymes in papaya are thought to be the source of its stomach-calming action. Following numerous examples of the anti-ulcer, anti-inflammatory, and gastroprotective effects of papaya in animal models, a double-blind, placebo-controlled study published in Neuro Endocrinology Letters (2013) highlights papaya's ability to significantly improve irritable bowel symptoms in patients suffering from constipation and bloating. Supporting cardiovascular health. An important advantage of papaya is that it supports cardiovascular health by lowering cholesterol; high cholesterol is a major risk factor for the development of heart disease. In a clinical study detailing the effects of papaya use in 42 human subjects, 400-gram doses effectively reduced LDL cholesterol levels by 19% (International Tropical Fruit Network, 2003). Healing wounds. For the treatment of chronic venous ulcers, a clinical study from La Revista Latino-Americana de Enfermagem (2015) observed the benefits of papaya in 16 patients with 30 venous ulcers. After being treated with 2% and 4% papain gels, the group experienced decreased lesion areas and increased epithelial tissue at the site of the wounds. After 57 days, both papain gels demonstrated an effectiveness of 20% in tissue repair of venous ulcers. Supporting skin health. A powerful beta-carotene- and lycopene-containing fruit, papaya benefits skin health thanks to its diverse nutritional profile. There is some evidence suggesting that prominent carotenoids found in papaya have photoprotective properties against intense UV light. A study published in the Chiang Mai Journal of Science (2014) established papaya's papain as an avid free radical scavenger comparable to vitamins C and E, which are both known for their anti-aging properties. Eliminating parasites. 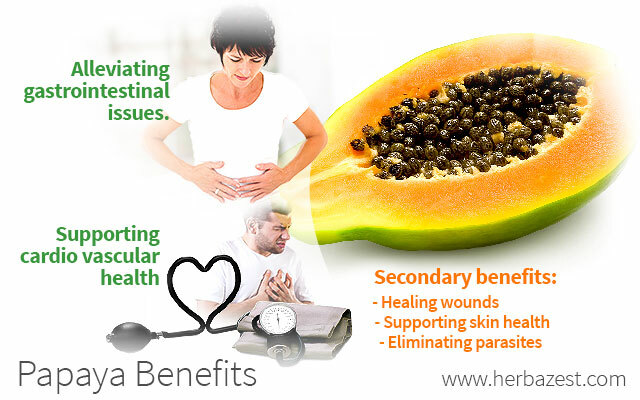 Papaya seeds have been used for ages to bring relief from roundworms and other bodily parasites. A pilot study published in the Journal of Medicinal Food (2007) highlights this unique papaya benefit. To determine potential efficacy of papaya seeds, researchers administered a 20-mL dosage of papaya seeds or honey elixir as a placebo to 60 asymptomatic children with traces of microscopic intestinal parasites in their stool samples. Over a period of only seven days, 76.7% of the patients' stool samples were parasite-free, compared with only 16% of the honey-treated control group. Moreover, no adverse side effects were noted, suggesting the safety of a papaya-based vermifuge therapy. Controlling male fertility. In recent years, guided by some of the long-held traditional beliefs about papaya's anti-fertility properties, some researchers have put forth new papaya benefits for male contraception. Studying its effects in male albino rats, research published in Planta Medica (1994) observed a dose- and duration-dependent reduction in sperm count, testicular weight, and libido across treatment groups. Treating diabetes. An in vivo study published in BMC Complementary and Alternative Medicine (2012) concluded that an aqueous extract of papaya leaves exhibited both hypoglycemic and antioxidant properties in diabetic rats. While plasma insulin levels remained consistently low in the papaya-treated rats, they increased significantly in the control group. This would indicate the benefits of papaya for diabetes prevention and suggest a need for human trials. Protecting the liver. Suggesting papaya's potential benefits for liver health, an in vivo study from the Biological and Pharmaceutical Bulletin (2002) observed its hepatoprotective effects against cirrhosis in albino rats. However, its exact mechanisms are still the subject of intense scrutiny. Enhancing immunity. The immune-boosting qualities of papaya were evaluated in a study published in the Journal of Academy of Medical Sciences of Bosnia and Herzegovina (2012). The results suggest that the aqueous extract administration of papaya could successfully prevent oxidative stress damage in male albino rats after a 40-day treatment period. Findings suggest not only the usefulness of papaya for fighting free radicals in the body, but also its inhibitory action against the formation of disease. Modern science has finally been able to validate what traditional folk medicine has known all along - that papaya benefits the human body through an impressive array of powerful medicinal actions. Aside from a few cautions, many people can safely experience the advantages of eating papaya or consuming it as medicine. Purdue University, Papaya, Carica papaya L.